Last week, came news of the passing of another player who skated in the Original six era. Ron Stewart died at the age of 79. In the late 1940s, Ron Stewart travelled to Toronto to join the Marlboros in the OHA. He was joined on the trip from Calgary by Norm Schriner, whose dad, Dave "Sweeney" Schriner, was a former Leaf. Due to their age, both were 16 years-old, their transfers to the east were blocked. While Stewart remained in Toronto to play one year of amateur hockey, young Schriner returned to western Canada. In 1949-50, Stewart became a member of the Toronto Marlboros. Stewart's final year in the OHA, 1951-52, was most eventful. Starting out with the Marlboros, he concluded the hockey year with the Guelph Biltmores. During the regular season, Stewart's time was divided between the Marlboros and Barrie Flyers. In the Memorial Cup, he helped Guelph win the championship. 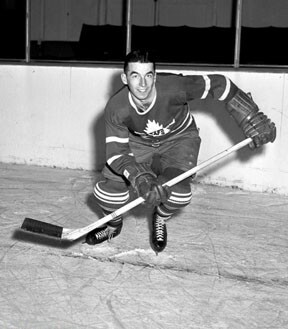 Following his success in junior, Stewart attended the Leaf training camp in 1952. 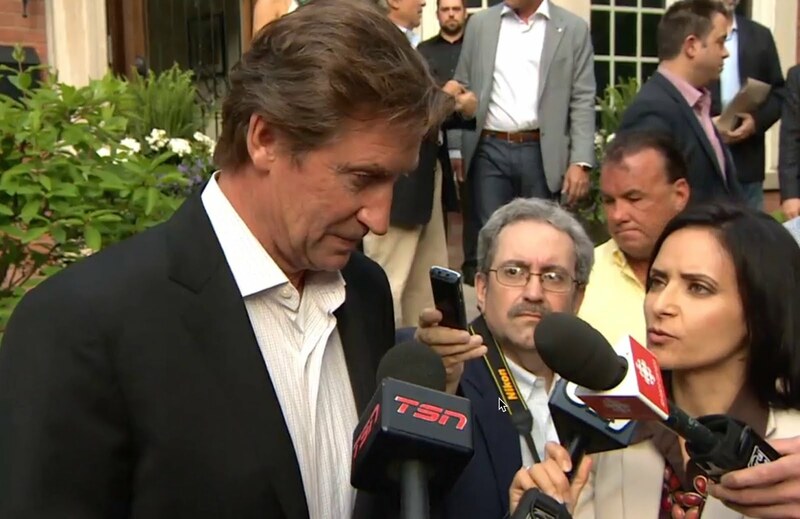 At camp, Stewart caught the eye of perhaps the most important observer - Conn Smythe. "There is the biggest surprise I ever had in hockey, and it is also the luckiest thing that has happened to us this year," commented Smythe in regards to Stewart in October 1952. When the Leafs opened the 1952-53 campaign on October 11th in Maple Leaf Gardens against Chicago, Ron Stewart took his spot on a line with centre Ted Kennedy and left winger Sid Smith. In Stewart's NHL debut, the Leafs fell to Chicago 6-2. With little time to lick their wounds, Stewart and his teammates travelled to Detroit for an encounter the following night (October 12) against the Red Wings. After twenty-minutes of play in the Olympia, the score was knotted at one goal apiece. Early in the middle frame, Stewart recorded his first National Hockey League goal to give Toronto a 2 to 1 advantage. The Leafs and Wings battled to a 4 to 4 draw with Kennedy-Smith-Stewart making a huge contribution. Captain Ted Kennedy fired in three goals and chipped in an assist. Sid Smith kicked in with three helpers. For his part, Stewart was happy to get his first tally under his belt. "Just another 199 and you'll be in the 200 circle with Bentley," Sid Smith told his linemate. The reference being to fellow Leaf and former Black Hawk Max Bentley. When all was said and done, Stewart participated in 1,353 NHL games. He not only hit the 200-goal mark, but surpassed it by 76 (276 Goals-253 Assists-529 Points). Stewart won three Stanley Cups with Toronto in 1962, 1963 and 1964. On June 8, 1965, Stewart was traded to Boston in exchange for Orland Kurtenbach, Andy Hebenton and Pat Stapleton. In addition to Toronto and Boston, Stewart laced-up his skates for St. Louis, New York Rangers, Vancouver and New York Islanders. 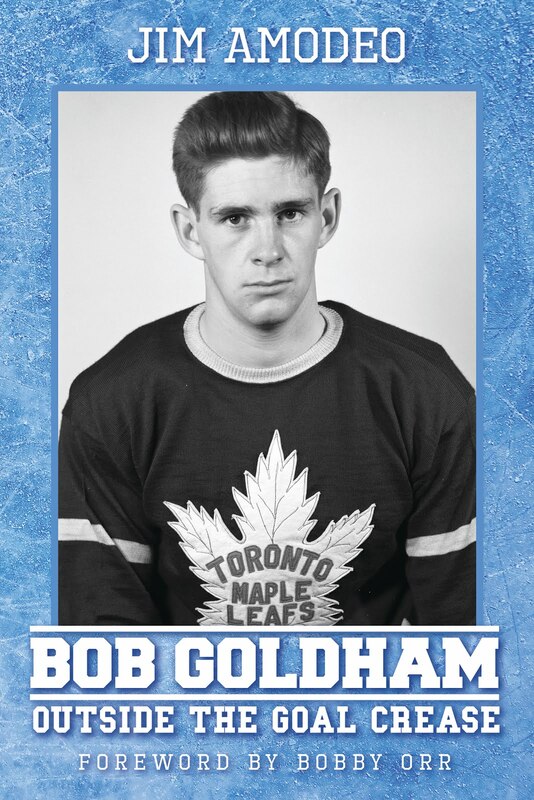 On the goal front, his most productive season came in 1958-59 with Toronto. Skating on a line with centre Bob Pulford and left winger Bert Olmstead, the 6-foot-1, 197 pound, Stewart hit the twine 21 times. Toronto Maple Leaf coach and general manager Punch Imlach described Stewart as being "one of the smoothest and most competent right wings around." At the NHL level, Stewart coached the New York Rangers for 39 games in 1975-76 (15-20-4) and the Los Angeles Kings for a full season in 1977-78 (31-34-15). Ronald George "Stew" Stewart was born on July 11, 1932 in Calgary, Alberta. Always looking for a good story. Author of Bob Goldham Outside the Goal Crease. Copyright Jim Amodeo. Simple theme. Powered by Blogger.